I got my first package from this game. From Sabrina. Thank you. Love the cute pins. Minnie is going right up on my Minnie pin board! Also want to appologize to the ones that are waiting for pins from me. I have been sick but they are in the mail so hopefully they should get to you next week. Unless the postal service or customs messes everything up again. Last time I shipped pins they took 6 weeks to arrive! But just so you know they are on their way and should get to you soon! Hope you will like them. Received this spectacular pin it up from Sarah. How did you know I am a Harry Potter junkie? Thank you so much for everything, you are amazing! You mentioned it in passing at Tony Roma's. What a surprise to get this package! I totally forgot about this completely! Thanks so much to Snoffsan for the perfect little package! I love all the pins! And my sis loves the Aurora goodies! I didn't even know that one pin was so detailed! It's gorgeous! And the Anna pin is fantastic as well! And my twin, Yzma! She's perfect! I recently got this one in a trade, but I'll be keeping this one in a special spot just in case. Im glad you liked it. 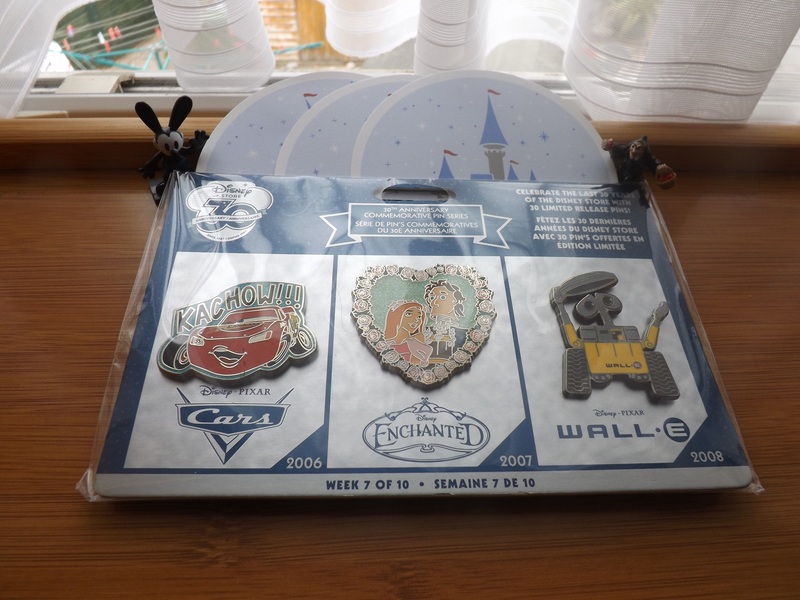 I was happy that I could at least find some pins from your want list even though it was no grail pins. I love them all. I've been concentrating on OE pins lately for trades, so this is perfect for me! Also, I forgot to plug your beautiful bracelet! You can find the wish bracelets on @snoffsancrafts. I put mine on last night and I really wish it comes true. [/URL][/IMG]I too was a recipient of a package from Snoffsan! Thank you for the pin and the zaps too!! Im glad I could find some pins from your wants list at least. Sorry I could stuff more stuff in there. And the old hag was one of the few Villains minis I didn't get ! My package from SiuJerkJai arrived yesterday! 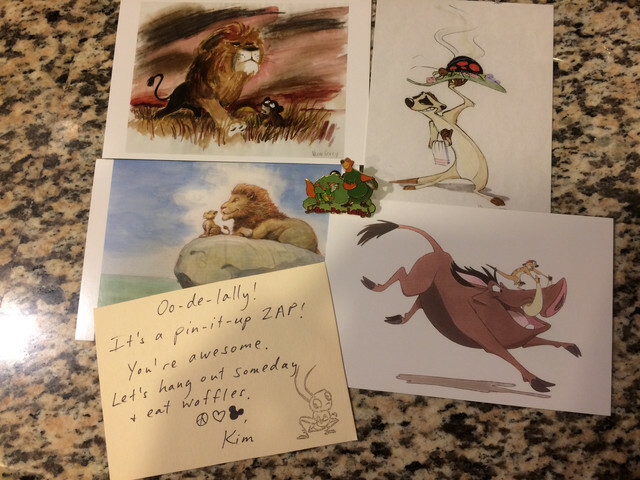 Four awesome Lion King postcards (I LOVE that concept sketch of Timon!) and a Robin Hood pin I didn't have yet! Look what I got in my package from Sora! You're very welcome! I'm so happy to hear it made you smile. My set is complete! Timeerkat zapped me with the Kingdom of Cute Sword in Stone pin Thank you! Oh, I'm glad! I didn't see it on your collection page but it wasn't on your wants, so I took a chance. You're welcome! Still havent got my second package so I might just sign up again. At least Im glad both my sent packages arrived! I made a separate thread for my amazing package from gbdb4ever- they went above and beyond the normal Pin It Forward and made it a full on ZAP package! Yay! I received my pin it up from Tamatoa today! My favorite princess - and I LOVE the artwork they came with! Thank you! You're very welcome! I'm so glad they got there okay! I'm sorry for the delay in posting here! Thank you so much, David! What a generous package. I litteraly screamed a bit when I opened my package from Lucy! She actually sent me a pin from grail sig! Im so happy and grateful!!! Thank you so much! 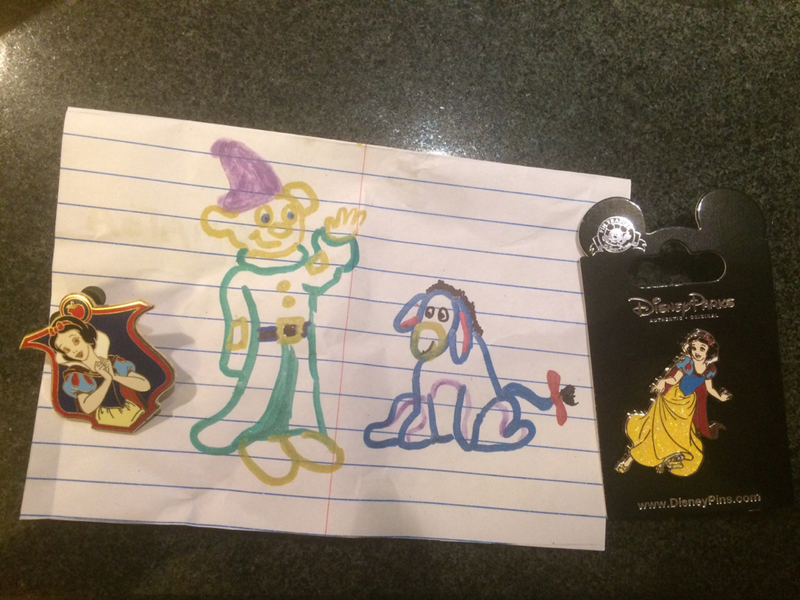 I loved the other pin (from my want list) as well and its up on my Olaf display but the Minnie and Mickey dressed as Aladdin and Jasmine!!!! Ahhhh! Yay!!! I was actually a little nervous about your package, I wasn't sure if I sent it correctly so I'm glad it made it safely. Your display is beautiful! I received my pin it up from Maia over the weekend and just got a chance to open it. I am so happy to finally have this stormtrooper, I've been after him for a while because he makes me smile. She also sent me the Aurora cameo and I am now 1 away from completing that set! Thanks so much Maia, I love my pins.